With such a vast country and different eating cultures, narrowing down the best restaurants in Las Vegas was quite a daunting challenge. Each of our 3 selections are based on a combination of location, deliciousness, and experience. Our list also leans towards the more luxury-inclined, so hole-in-the-wall family bistros aren’t included. Instead these are the kind of restaurants you can propose to someone in! It’s no surprise that Vegas would be included here. There are dozens of designer restaurants with celebrity chefs all vying for your attention. While Fix doesn’t have a famous chef, we picked it for it’s all around deliciousness…and wine selection. Located just off the Bellagio’s casino floor is a warm, quiet, contemporary restaurant that has something for everyone. The wine list is off the charts (try the Monchoff! ), and their sophisticated spin on Macaroni and Cheese is not to be missed. They also have the usual luxury comforts: the filet mignon is delectable, as is their steak. 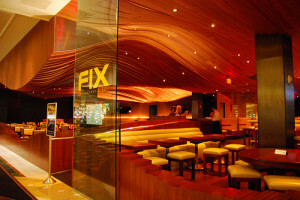 Fix is not the flashiest Vegas restaurant, but it consistently leaves those who can afford it satisfied. Located on the second floor of the Outrigger Hotel, Hula Grill has a view of the ocean that just can’t be beat. The restaurant’s dress code is semi-formal, so you should wear your fanciest Hawaiian shirt and shorts to the restaurant. What sets Hula Grill apart is their seared ahi. They also have excellent Poke, which is essentially a saltier version of the same thing. Even if you’ve had a Mai-Tai, you really haven’t had a Mai-Tai until you try their version. Heavy on the rum with a fresh mix of tropical juices. Underneath is Duke’s, a famous college bar that spills out onto the beach. Either tip toe around them, or join them for a great time. Call for reservations around sunset: they tend to be busy.